Welcome to our exclusive horse racing stable tours with the following leading racing trainers - Kim Bailey, Fergal O'Brien, Martin Keighley, Micky Hammond and Robin Dickin - they make the perfect present for the racing fan in your life. Our exclusive three-hour breakfast stable visit experience is £95 per person, but for as little as a pony (£25) you can make a deposit and pay the balance 14 days before the date of your visit, or pay in full at the time of your booking and receive a £5 discount (cost per person £90). What can I expect on a Course & Distance stable tour experience? You'll enjoy a trip to the gallops to watch the racehorses being put through their paces and enjoy an exclusive, informative and entertaining tour of the stables with the trainer to gain a true insight into what it takes to train a racehorse and prepare it for a race. Afterwards you'll enjoy breakfast too. Just a quick email to thank you very much for organising our tour at Fergal O’Brien's yard - we had a fantastic morning. 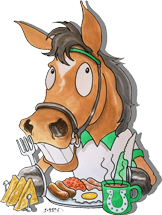 … We had some great weather and the spectacle of seeing the horses on the gallops and in their stables was superb.​..
Kim and his team were first class and the breakfast was fantastic too! I would definitely recommend to any horse racing enthusiasts. ...Ian had a lovely time thank you, he really enjoyed it and was made to feel very welcome by the all the team especially Kim. ..